In Raster Vision we keep a separation between configuration of a thing and the creation of the thing itself. This allows us to keep the client environment, i.e. the environment that is running the rastervision cli application, and the runner environment, i.e. the environment that is actually running commands, totally separate. This means you can install Raster Vision and run experiments on a machine doesn’t have a GPU or any machine learning library installed, but can issue commands to an environment that does. This also lets us work with configuration on the client side very quickly, and leave all the heavy lifting to the runner side. This separation expressed in a core design principle that is seen across the codebase: the use of the Config and ConfigBuilder classes. The Config class represents the configuration of a component of the experiment. It is a declaritive encapsulation of exactly what we want to run, without actually running anything. We are able to serialize Configs, and because they describe exactly what we want to do, they become historical artifacts about what happened, messages for running on remote systems, and records that let us repeat experiments and verify results. The construction of configuration can include some heavy logic, and we want a clean separation from the Config and the way we construct it. This is why each Config has a separate ConfigBuilder class. The ConfigBuilders are immutable data structures that use what’s called a fluent builder patter. When you call a method on a builder that sets a property, what you’re actually doing is creating a copy of the builder and returning it. Not modifying internal state allows us to fork builders into different transformed objects without having to worry about modifying the internal properties of the builders earlier in the chain of modifications. 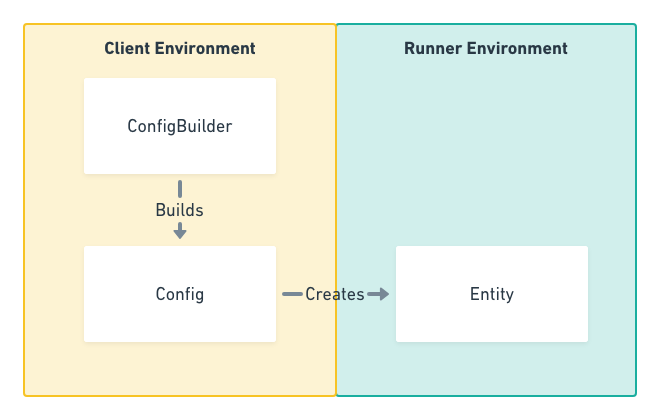 Using a fluent builder pattern also gives us a readable and standard way of creating and transforming ConfigBuilders and Configs. The ConfigBuilder also has a .validate() call that is called whenever .build() is called, which gives the ConfigBuilder the chance to make sure all required properties are set and are sane. One major advantage of using the ConfigBuilder pattern over simply having long __init__ methods on Config objects is that you can set up builders in one part of the code, without setting required properties, and pass it off to another decoupled part of the code that can use the builder further. As long as the required properties are set before build() is called, you can set as little or as many properties as you want. The ConfigBuilder is created from the static method on the Config class, e.g. rv.TaskConfig.builder(rv.OBJECT_DETECTION). Keys for builder types are also always exposed in the top level package (unless your key is for a custom plugin, in which case you’re on your own).